The implicitWidth and implicitHeight of a control are typically based on the implicit sizes of the background and the content item plus any insets and paddings. These properties determine how large the control will be when no explicit width or height is specified. 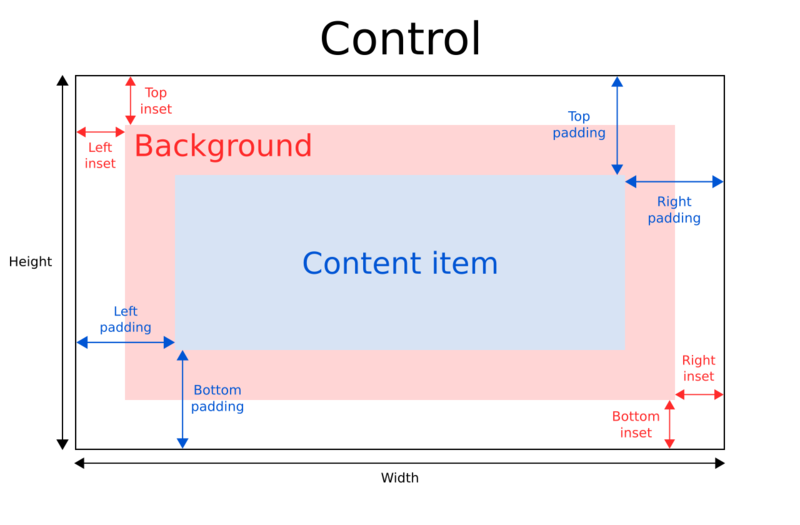 The background item fills the entire width and height of the control, unless insets or an explicit size have been given for it. Background insets are useful for extending the touchable/interactive area of a control without affecting its visual size. This is often used on touch devices to ensure that a control is not too small to be interacted with by the user. Insets affect the size of the control, and hence will affect how much space they take up in a layout, for example. This property holds the bottom inset for the background. This property was introduced in QtQuick.Controls 2.5 (Qt 5.12). See also Control Layout and topInset. This property holds the bottom padding. Unless explicitly set, the value is equal to verticalPadding. See also Control Layout, padding, topPadding, verticalPadding, and availableHeight. This property holds the horizontal padding. Unless explicitly set, the value is equal to padding. See also Control Layout, padding, leftPadding, rightPadding, and verticalPadding. This property holds the implicit background height. The value is equal to background ? background.implicitHeight : 0. See also implicitBackgroundWidth and implicitContentHeight. This property holds the implicit background width. The value is equal to background ? background.implicitWidth : 0. See also implicitBackgroundHeight and implicitContentWidth. This property holds the implicit content height. For basic controls, the value is equal to contentItem ? contentItem.implicitHeight : 0. For types that inherit Container or Pane, the value is calculated based on the content children. See also implicitContentWidth and implicitBackgroundHeight. This property holds the implicit content width. For basic controls, the value is equal to contentItem ? contentItem.implicitWidth : 0. For types that inherit Container or Pane, the value is calculated based on the content children. See also implicitContentHeight and implicitBackgroundWidth. This property holds the left inset for the background. See also Control Layout and rightInset. This property holds the left padding. Unless explicitly set, the value is equal to horizontalPadding. See also Control Layout, padding, rightPadding, horizontalPadding, and availableWidth. This property holds the right inset for the background. See also Control Layout and leftInset. This property holds the right padding. Unless explicitly set, the value is equal to horizontalPadding. See also Control Layout, padding, leftPadding, horizontalPadding, and availableWidth. This property holds the top inset for the background. See also Control Layout and bottomInset. This property holds the top padding. Unless explicitly set, the value is equal to verticalPadding. See also Control Layout, padding, bottomPadding, verticalPadding, and availableHeight. This property holds the vertical padding. Unless explicitly set, the value is equal to padding. See also Control Layout, padding, topPadding, bottomPadding, and horizontalPadding.